If you're looking for something Fun and Unique, you've come to the right place. 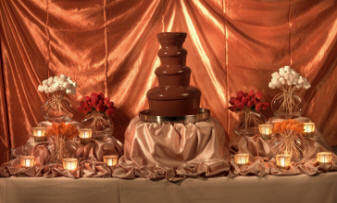 California Chocolate Fountains are an Unforgettable Conversation Piece that will Enhance any event. Dipping your favorite fruit or other goodies into the Chocolate Fountain is not only Delicious, but Entertaining as well! Your guests will be talking about your event or party for months and even years to come! At California Chocolate Fountains, we strive to provide only top quality service to ensure an excellent chocolate fountain experience. We are a California based Chocolate Fountain company and have Chocolate Fountains for rent or purchase in two sizes and can handle events from 20 to 2,000 guests. Chocolate fountains are quickly becoming a must have at weddings, parties, fundraisers, corporate events, birthday and anniversary parties, as well as just about any other social gathering or event. Your Best Bet for Chocolate Fountains in Stanislaus County California CA! #1 in Service for Chocolate Fountains in Stanislaus County California CA!